Happy National Library Week too! The UWGB Cofrin Library was envisioned by Chancellor Weidner and the architects as the heart of the UWGB campus. Ground was broken for the present library building in 1970. Known at the time as the Library Learning Center, the building opened for use in February 1972. It was renamed in 1990 to honor a major campus donor, David A. Cofrin. 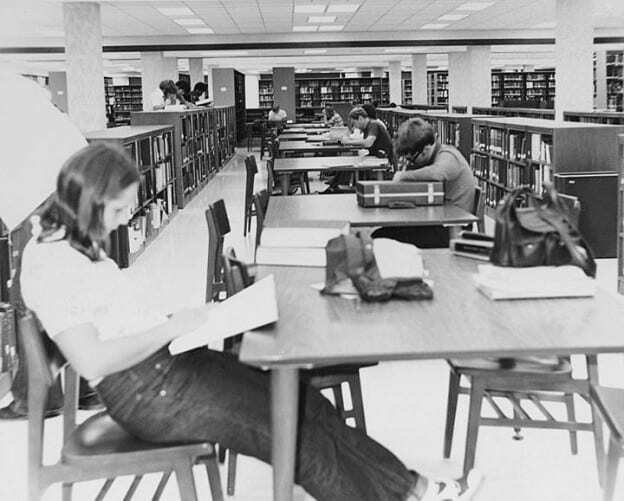 Prior to 1970 the Library had homes in downtown Green Bay in Schmitt’s Discount Store (located at 1276 Main Street) and the Instructional Resources (Services) Building, approximately where CIT and the General Access Lab is now located. This content was originally posted by the UW-Green Bay Archives and Area Research Center to their facebook page on Thursday, April 16, 2015. View the original Facebook post. This entry was posted in Throwback Thursdays on April 16, 2015 by Kimberly Vlies.